It’s the fifth day of September and there is a strong sense that the story of 2008 has turned another page. My wife and I have left kids to school and have made our way to the shore. We walk to the end of the beach and find our way to the track without really thinking of how long we might be out. I have hidden the dog’s ball in my pocket and without the distraction he burrows into hedges and marks out his own path. Across the Irish Sea, Ailsa Craig is plainly visible, clear and present to us despite the miles. On some grass covered land closer to the sea a dog trainer is blowing a whistle and his springer spaniel responds with incredible obedience to the intent of his master. Time and again he returns to his masters feet and sits quietly until the next instruction is given, then he bounds away again full of energy and delight, springing over the grass until the whistle says stop. We watch in awe while Tobey ignores us in favour of some foul smelling, muddy concoction by the path. A little further on, where the track narrows and the brambles grow tall on either side we discover once again that we are wholly unprepared for the glorious bounty of the season. Pulling a bag from her pocket Ade is soon engrossed, as I am too, in picking voluptuous blackberries from the hedges and soon our hands are stained red as if we had committed some heinous crime. Blackberry picking has been part of our autumn ritual since we were newly wed. In years gone by it was a whole family thing, uncles, nephews, cousins, parents children. Now with kids that little bit older and engaged in their own stuff, and parents who are now more frail it’s mostly just us two, but no less pleasant for all that, though it does remind me of how time is passing. And so quickly. Each year this rich bounty appears. We don’t do anything to merit it. We don’t often notice it’s progress and development until it just appears and we are amazed. 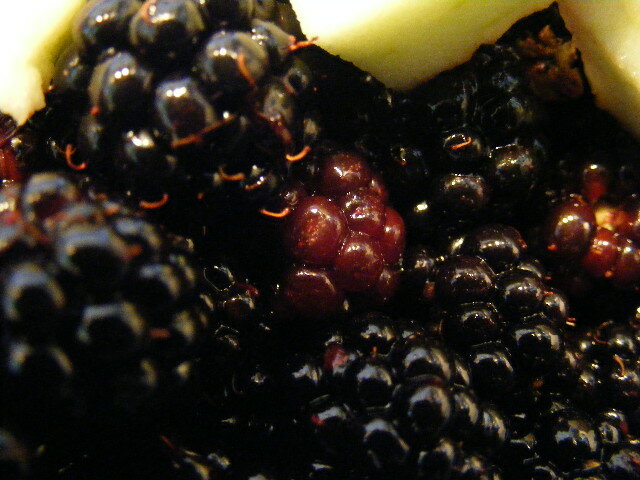 It seems that one day the berries are still red and green, the next deep and full and black. To me it’s a sign of grace. After a few moments of concentrated attention, our eyes become accustomed to the bushes and we begin to notice more and more. We have been trained to look and there, in the out of the way places, the hidden places under leaves or behind nettles are hordes of the delightful fruits. Through the thorns the riches lie. Both of us sustain zig-zags of cuts, scratches and stings which are necessary to gather a rich haul. They are the markers of success. We also remark to one another of how time seems to move at a different pace . We walk now along this familiar track at the pace of the bounty. We stop frequently, sometimes every three or four paces as the berries reveal themselves and at that point all other priorities that may be waiting for us back home, just take on a lesser significance. Without talking explicitly about it, we deliberately don’t pick every berry available. The bushes aren’t stripped bare because we know that, rare and all as they are these days, there will be other foragers who will come after us and we want to make sure that they share the joy and peace we have felt. And there are the birds, the wasps and insects and the mice who’ll take some too. There is enough for us all. It always happens. The biggest and juiciest berry of the day gets away. My grasping hands overestimate the gentleness of their touch and I drop it into the darkness of the hedgerow before I can get it to the bag. Never mind! There will be more. After 90 minutes, we realise we really must leave, but it’s tough to walk past the clusters. Back home I weigh out 4 lbs of fruit which by tonight will be transformed into blackberry and apple jelly which will stir memories during the long seemingly fruitless winter. My mouth is watering! 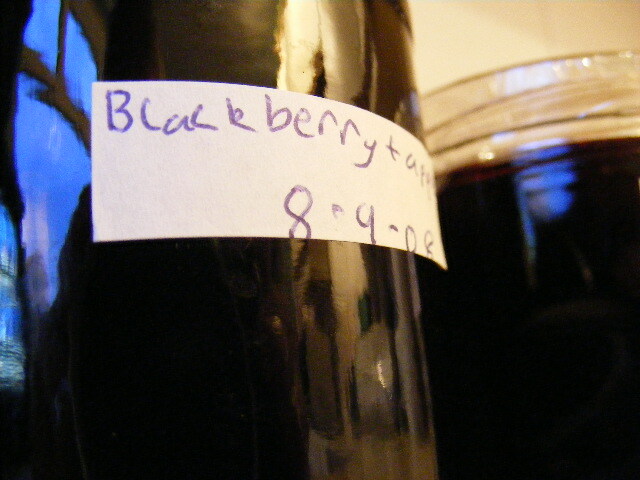 Reminds me of a trip to the N. Calif. coast where we stumbled upon blackberries in season. We dawdled through the brambles like a couple of black bears! sounds ideal Maria…but you do get real bears there too. It’s much safer here thankfully. As I write this my wife and I are enjoying toast with the first blackberry jelly of the season. I really liked your story. Picking berries is something I want to do with my future wife someday.